From a young age I was intrigued by books, all kinds of books. The stories became alive with my imagination like no 3D movie can. I devoured books and chose their company most of the times. And still today I love to read*. And if you are wondering what this has to do with art? Well, you will find out shortly. Another thing I have always found interesting is art. This could be due to the fact that I realized I could draw better than the other kids. This inspired me to draw even more. In the end this would become the career path I chose…eventually. Okay so….I love books and I love art. Combining those two you get something called artist books…Well not quite but that’s how I choose to see the two come together. 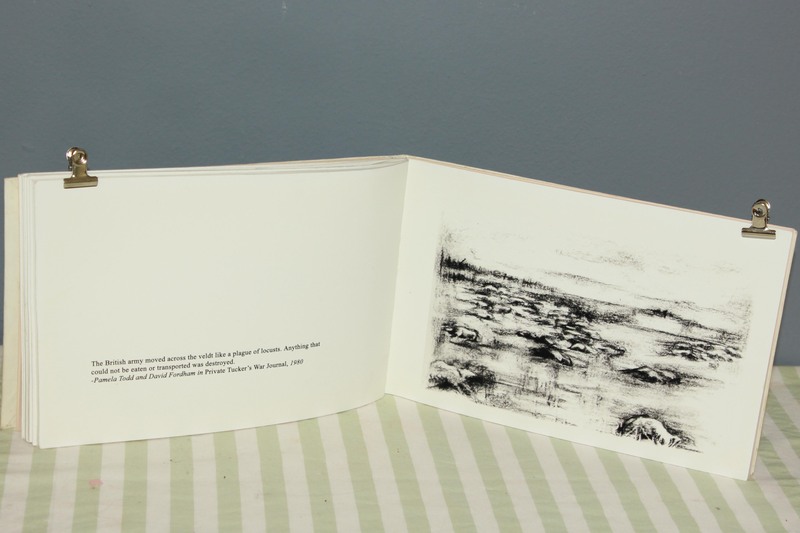 What is an artist books actually? That’s where it becomes interesting. There are so many things that artist books are and aren’t and some even overlap; I am finding it extremely difficult to explain, and by saying it just is wont suffice. Artist books are not books bought in a store telling you about certain artists and their works. 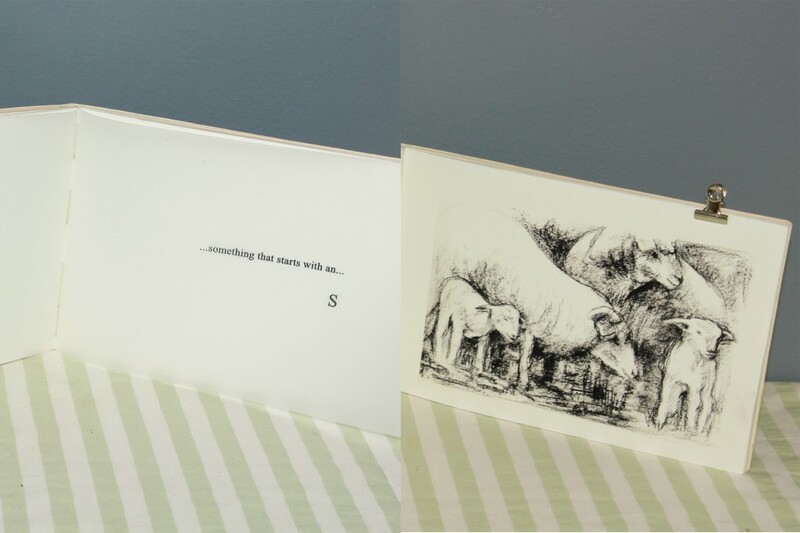 Artist books are not children’s books although it can be playful. It could be made by an artist but on the other hand you don’t need to be an artist to create one. I believe there should be some sort of artistic quality to it; it should have a good conceptual side. There can be text, there can be images. The more I explain the less I get to a point. There’s something whimsical, magical, beautiful, interesting and intriguing about this art form. It can be a parody, it can be comical, it can be anything as long as the intent is art and the format is a book form. And even that statement is true and untrue in the same breath! I never even knew that something amazing such as artist books existed until my third year at varsity. We did a short photography class in second year printmaking and was instructed to hand in a book for our first project. 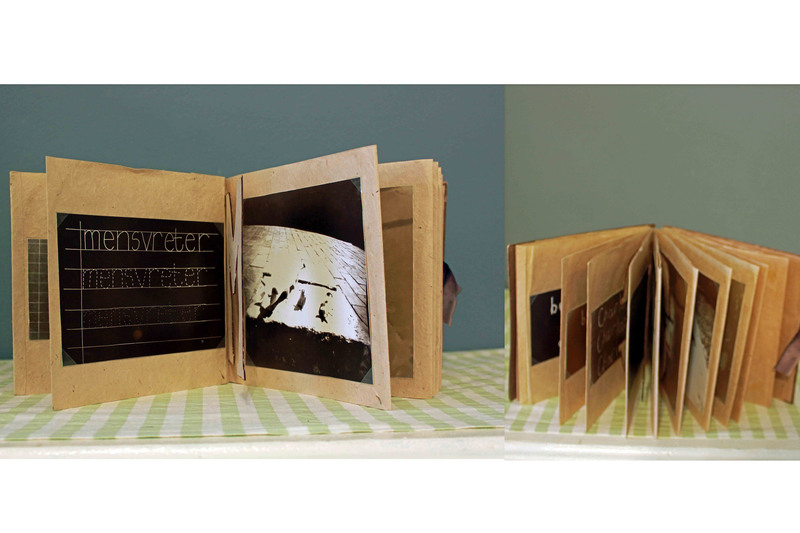 I decided to make an alphabet book and my pinhole photos depicted different images and words relating to war and the horror it entails. It focuses specifically on the Anglo Boer War in South Africa in the early 1900’s. At the beginning of my fourth and final year as Fine Art student I was facing a big dilemma. I had no idea what I could do. And it was the evening before I had to present my concept to my lecturers. I knew that I would continue to focus on the Anglo Boer war. I found it immensely interesting and I am disgusted by it at the same time. How do you present this theme to people without boring them to death? How do you make something boring fun? You turn it into a game, a fun exciting journey that slowly leads you towards the real issue until it’s too late to turn around and it is there right in front of you. How can you take people on a fun exciting journey? Well, through books. So I need a book, which plays a game, and in the end addresses an actual issue. And right there my problem was solved! Children’s books for adults. Playful and fun with a dark and serious undertone. 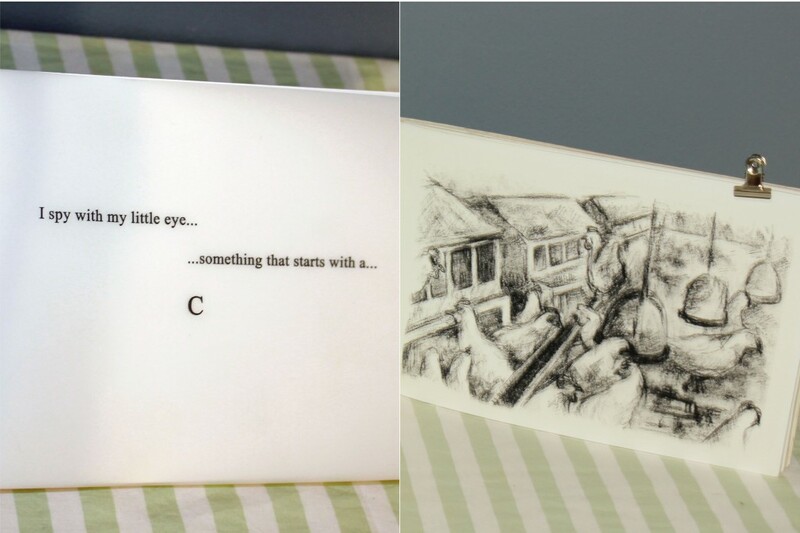 And out of complete desperation my first artist book called I Spy… was born. 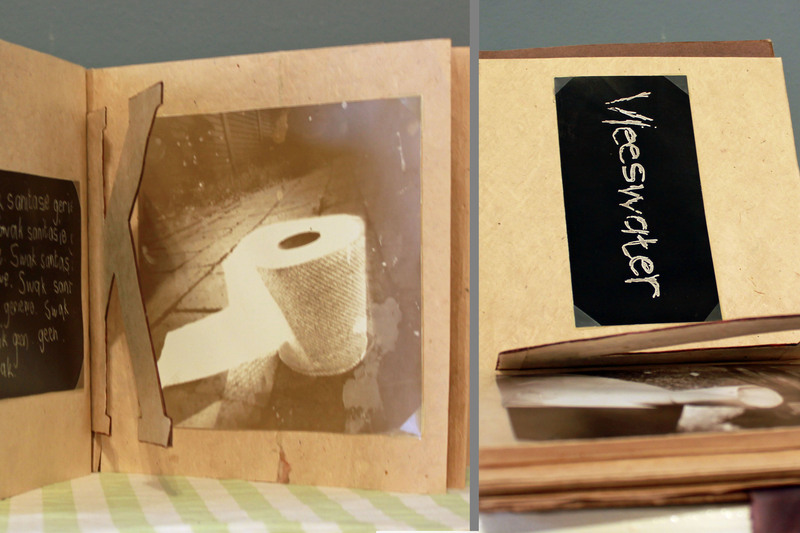 I made six artist books that year and I am going to give a quick explanation of each. I was thinking of the song Old Mac Donald had a farm and also a game we often played in the car as children, I Spy with my little eye. For instance someone would say: ‘I spy with my little eye something that starts with an A’, the other people then have to guess things they see around them that start with an A until someone guesses correctly. So the book starts with I spy with my little eye something that starts with a c and when you turn the page there are chickens. The next page reads I spy with my little eye something that starts with a p and the next page boasts a pig. The next page says I spy with my little eye something that starts with a S and the next page shows sheep. The British army moved across the veldt like a plaque of locusts. Anything that could not be eaten or transported was destroyed. Pamela Todd and David Fordham in Private Tucker’s War Journal, 1980. In this work I explored the notion of the book as an art form. This book consisted of charcoal drawings and text that I have collected. It explores issues regarding the Anglo Boer War. This book in particular refers to the English soldiers plundering and killing livestock in order to starve the people out. The next morning I presented my little book to my lectures. They loved it. And there I realized that I had stumbled onto something great. I was able to combine two things that I love, art and books. This was part one of a two part series on my artist books. *So before I carry on I feel I need to share my three favourite books with you, there are many other amazing ones but for me these three has stuck. Number one is The Book Thief by Markus Zusak, number two is Incredibly Loud and Extremely Close by Jonathan Safran Foer. The third place goes to Life of Pi by Yann Martel. ek stel belang in jou klasse asb. watter tye het jy plek en hoeveel kos jou klasse? Ek is nie seker of ons al gesels het nie, maar ek was net lank nie op my website nie. Ek het nog plek in my klasse, oggend en aand klasse. En dit is R500 per maand. Indien jy nog belangstel stuur asb vir my n email via die kontak bladsy. Skies jy moes so lank wag. A very interesting concept that keep the element of surprise. Not only does the reader observe and appreciate the art, it also stimulate the senses and prompt the reader to be more involved in the themes recorded. Thank you for the positive feedback. The idea is to involve as many senses as possible, if you as viewer are actively involved, even if it is just to turn the page, you feel part of the work. The viewer/participant is an integral part of the artwork.